Wooden chess set cheers up your holiday! In the picture above, it describes a perfect example of locating wooden chess set for outdoor game. 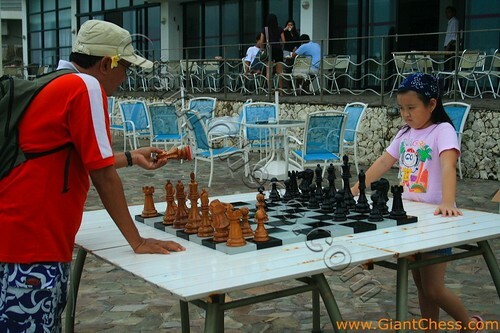 Placed outside the hotel, you will have a great experience of playing chess game and enjoying the beach view. Wooden chess set is a good companion for your holiday. Our chess piece and board are easily located in various places and easily carried. In your leisure and holiday, big chess will be a good companion. Those are made from best quality of Teak wood and carved by good craftsman. Its good material will allow you to left it outdoor for months without worry about the wood damage because it made from the strongest wood. Just enjoy your outdoor chess game with our best chess set. As seen in the picture, playing chess in a beach gives you memorable summer holiday.